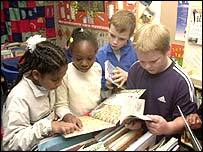 The way children are taught to read in primary schools in England will be shaken up, Education Secretary Ruth Kelly has confirmed. 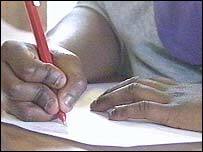 The government has accepted a review which backs the greater use of a method called synthetic phonics. Children are taught the sounds of letters and combinations of letters before they move onto books rather than reading simple books from the start. Critics say the approach could stop pupils from getting a love of reading. The review was carried out by Jim Rose, a former director of inspections at England's schools' inspectorate, Ofsted. He said the system should be used "first and fast". Phonics is used in most schools, but not necessarily in a systematic or prescriptive way. These changes would mean that all children would be taught this way before the age of five. Current government guidelines advise schools that phonics should be used alongside other methods. Education Secretary Ruth Kelly said she accepted the findings and saw a "real opportunity" to teach the system. She would make sure the system was taught as early as possible in schools, she told BBC Breakfast. "There is a real opportunity to teach synthetic phonics systematically, but also other skills so necessary to children learning to love reading and learning to speak and communicate effectively." But many teachers fear synthetic phonics does not suit all children's learning styles and argue it can destroy the joy of reading. The review says that the teaching of reading must go hand in hand with developing children's speaking and listening skills and that the quality of teaching is central. It calls for "early systematic, direct teaching of synthetic phonics" to be the first strategy taught to all children learning to read, introduced by the age of five. It also focuses on the need for some children to have intensive "catch-up support". Mr Rose says there is general agreement that phonic work is "essential though not sufficient" in learning to read, but that there is also much debate about the best way to do it. "Despite this positive consensus about the importance of phonic work, there are deeply divided professional views about how phonic work is best taught," he said. He told the Today programme on BBC Radio Four why he advocated synthetic phonics: "It is a crucial part of learning to read. "It is not the whole story but I think now research, generally speaking , and indeed best practice, shows us that this is for children, beginner readers in particular, absolutely important." The final version of the Rose review, expected early next year, will inform the government's redrafting of its literacy strategy, planned for 2007. In pure synthetic phonics, children learn to read using the sounds of letters rather than the names. So a letter "D" is said "duh" not "dee". They learn to put the sounds together to make simple words such as "c-a-t". They also learn blends of certain letter sounds, such as "ch" or "bl". Only once they have learned all the letter sounds and the blends do they progress to reading books. The system also helps children to break down unknown words, experts say. Many schools in England already use phonics, combined with other methods to help children to read, but proponents of synthetic phonics argue it should be followed strictly and not be mixed with other approaches. In Scotland, schools are already being encouraged to take up synthetic phonics. The success of a pilot scheme in a school in Clackmannanshire brought widespread attention to the system. The Conservatives called for a policy of synthetic phonics during the general election campaign. Shadow Education Minister Nick Gibb said: "The Conservative Party will do all it can to help the government implement these proposals because research has shown, time and time again, that synthetic phonics is the most effective way of teaching children to read." The Liberal Democrats' education spokesman, Edward Davey, said: "We welcome the recommendation that phonics should be the first, but not the only method for teaching reading. "Rose has struck a careful balance, that should give teachers enough leeway to consider each child's individual needs, after the unfortunate politicisation of this issue." Head to head: Synthetic phonics ?